This week marks the 7th anniversary of the iPad’s availability on the market. The Verge reminds us of their initial take on the product. There were two main stands iPad reviewers took back in 2010. Some industry watchers thought the iPad could become the next computing platform — at least for some people. Others believed the iPad would mainly be successful with users with extra disposable income as well as users who wanted a simpler computing experience and did not need much. Seven years in and the debate remains the same: is the iPad the next computing platform or merely a superfluous device? Apple is certainly trying with the new ads to make us believe the former is true but consumers do not seem to be convinced yet. I am focusing on the iPad because, although many tablets followed it, none ever came close to the volumes Apple has been able to sell. Even now when sales are in decline, iPad remains the best-selling tablet in the market. At Creative Strategies, we recently ran an extensive study looking at Millennials’ preference of both devices and apps when it comes to collaboration. It is interesting to look at their device preference for productivity because this is “The Touch Generation”. We focused on 18 to 24 year olds to gather their expectations as they enter the workforce or soon after joining it. This is the age group that experienced the early stages of touch on smartphones the same way as Gen Z is today experiencing many voice-first interactions. They are not only very comfortable with touch but get a lot done with their phone which would put them in an ideal position to understand what they could do with a tablet. We asked our panel of over 1200 US millennials several questions around how they prefer to collaborate, what devices they use, what app and services they use and what communication medium is their preferred one. 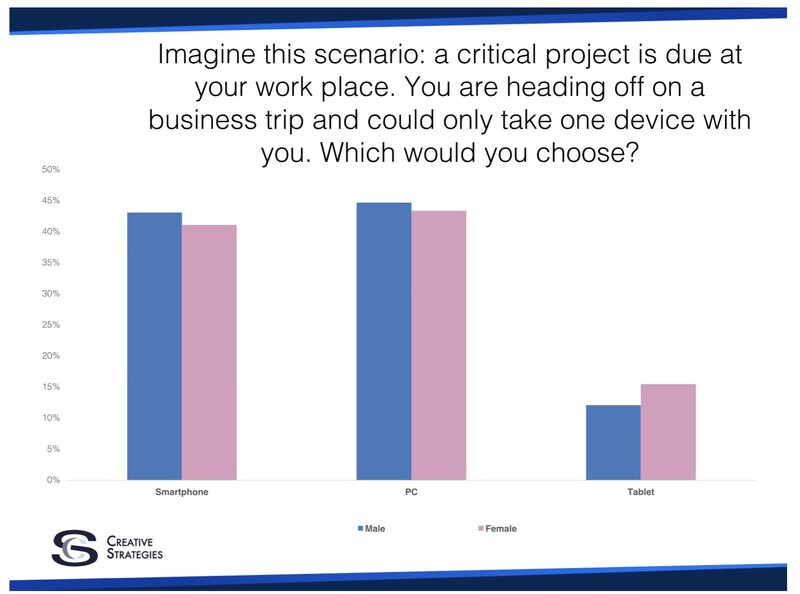 One of the question asked them to think about which device they would take on a business trip with them if they knew they had a project due at work. As you can see from the chart below, there was no question about the tablet as the device of preference. Only 12% of male and 16% of female millennials would take a tablet with them. The rest of the panel was pretty evenly split between taking a smartphone or a PC. It is when you dig into the why they would pick that particular device we get some clarity on where tablets stand. Most millennials who picked a smartphone valued the communication side of the device. Being able to make calls and use messaging apps was the biggest selling point. There was also a consensus that, “anything needs doing can be done on a phone.” On the PC side, the main two drivers were screen size and range of apps. Millennials who would not leave without their PC really appreciated the larger screen real estate and believe there are certain productivity apps they would not be able to run on a phone. 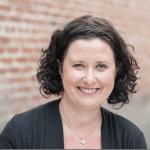 Communications mattered to these millennials too, but they thought that, between apps and VoIP calls, they could get the job done. Some were even prepared to go old school and use a landline if absolutely necessary. The bottom line for people choosing the PC was, if you want to do real work, there is no other option. The smaller percentage of millennials who would take a tablet on their trip are Apple’s sweet spot. They are the ones that understand they can do what they can do on a phone, including communications, and get the larger screen. They referred to the tablet as a happy medium, the best of both worlds, and as a device that gets the job done. Interestingly, a few called out Microsoft Office as an app that makes using a tablet as a main device easy. These are users that believe in the ability of a tablet to be the next computing platform. Overall, this set of results very much points out the perception that the iPad, the best in class tablet, had back in 2010 — it was only good enough for light productivity. It still rings true today to many consumers, even open minded millennials. What has also negatively affected tablet uptake has been the progress in processing power and screen size many smartphone models have undergone. Are 2-in-1s a Tablet or a PC? While analysts and marketers love putting labels on devices, consumers seem to be a bit more pragmatic. If it quacks like a duck and it walks like a duck, chances are it’s a duck! We wanted to test whether millennials were interested in iPad Pro, Surface, or other Windows 2-in-1s as their primary laptop so we asked. 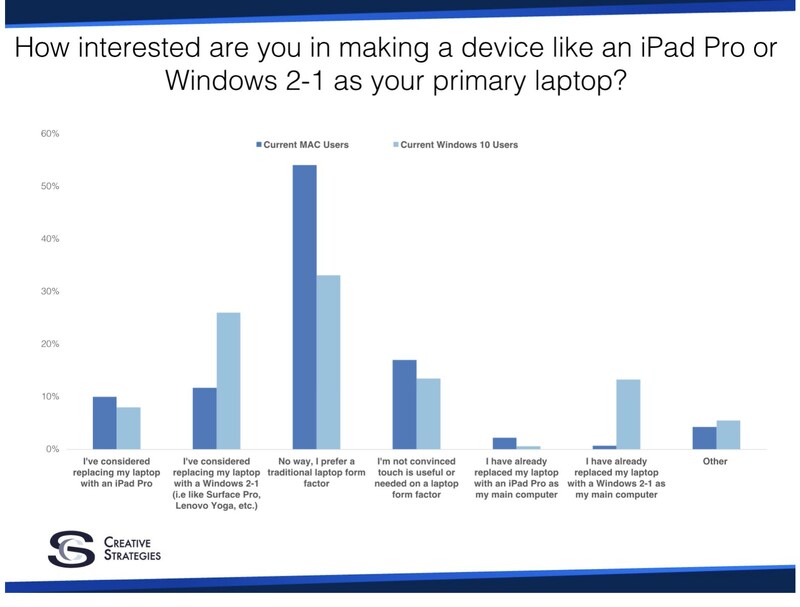 Overall, only 18% of the panel was interested in a Windows 2-in-1 and only 9% was interested in an iPad Pro as a substitute for their laptop. Forty-nine percent came right out and said, “No way, I prefer a traditional laptop form factor”. Another 16% is not convinced touch is useful or needed – so Apple is not alone thinking that a touch screen is not a must-have in a laptop form factor. Once again, when digging a little deeper and looking at the data by operating system the panelists are currently running on their computer, things get very interesting. Current Windows 10 users are much more open to the idea of using a 2-in-1 as their main laptop than current Mac users. This highlights two main points: on the one hand, Microsoft and all the OEMs have succeeded in positioning 2-in-1s as PCs. On the other, Mac users still see their devices as superior to an iPad Pro or a 2-in-1. While the difference is less striking when it comes to the role of touch, current Mac users do have more doubts on how much it is needed in a laptop. My hypothesis that 2-in-1s are seen more as a PC while iPad Pro is still seen more as a tablet is backed up by the data we get if we cross these two questions. When you ask, “Would you consider replacing your laptop with an iPad Pro?”, 22% would take a tablet on their business trip while only 16% of millennials interested in using a 2-in-1 as their main PC would pick a tablet for the trip. This corroborates my hypothesis that iPad Pro has yet to establish itself as a PC and Apple has more work to be done. While the Windows ecosystem could convince consumers 2-in-1s were PCs mainly through advertising, they had a great advantage over Apple in the operating system that most consumers know as a PC operating system. This means Apple needs to do more than advertise, especially at an enterprise level which is exactly what they are doing with their collaboration with SAP in particular. If we consider millennials’ attitude to communication in our survey, it is clear the way they communicate has changed quite significantly. Messaging, video calling, and voice through apps not phone-based have taken over. Empowering the work place with apps that take advantage of the iPad and create new workflows will have the same impact. While this might not affect the sales trajectory of the iPad any time soon, I do believe it will make a difference in enterprise for iOS. The big question is whether the iPhone or the iPad will be the main benefactor.